Since 2009, Grand Rapids, Michigan has held an international art competition named ArtPrize. The entire downtown, along with venues outside the core city, becomes a ‘canvas’ for thousands of artists from around the globe. There are several prizes awarded by different methods, but the main prize of $200,000 is decided by the public. Votes are cast on cell phones as the viewers tour the city. It doesn’t matter if it is the county courthouse, a coffee shop, the local bar, the chamber of commerce, even the Grand River itself; art is present in some shape or form. The entire city is filled with people, which is a huge plus for the local businesses. The photo above was taken outside the Gerald Ford Museum. Jerry’s statue, a permanent fixture, is being stared at by a piece named “Gravity”. 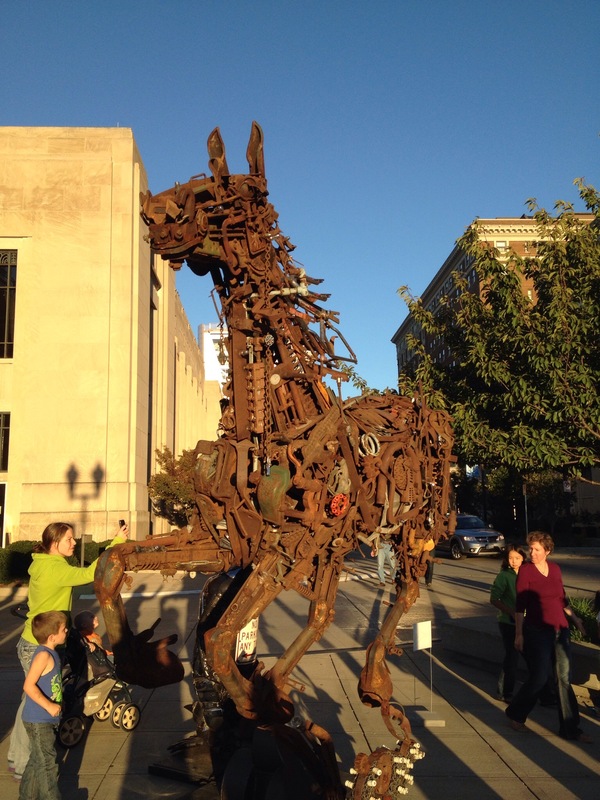 This is a horse made of industrial metal scrap. Very interesting. Our next door neighbor in the campground created this one. It is called Seewall Child, and it is quite detailed. Her and her husband were very passionate about her work, and they install an interactive version of these at children’s hospitals. This was installed at a local pizzeria for the competition. We had a pizza while we were there, and at least 50 people streamed through the building, just to see the art. Some grabbed a slice from the counter. 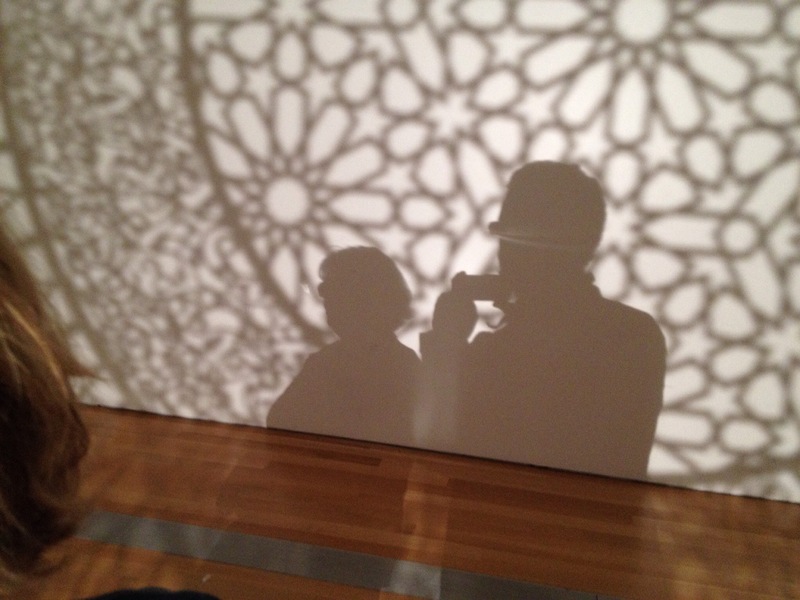 This is a piece called Intersections, and it was at the Grand Rapids Art Museum. 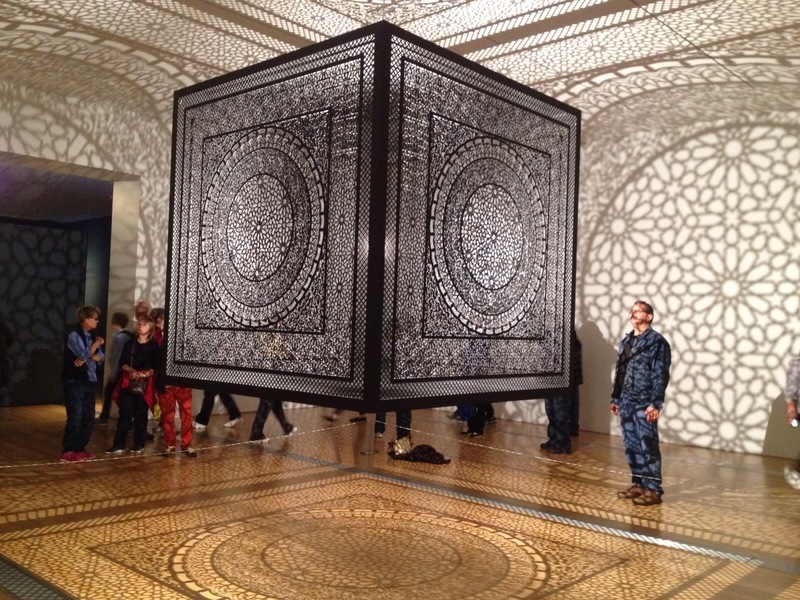 What is seen on the walls is a projection of a single light bulb through the metal cube in the center of the room. Outstanding. Our reflection on the wall. People were having a lot of fun with this. Our favorite was called Connected. Thirty three artists were paired with thirty three storytellers and they were given a word to work with, such as love, courage, passion, etc. The result was one of the most emotional experiences we have had in quite awhile. While we were reading a piece written by a woman who was dying of cancer, her daughter came up and spoke with us. She had just arrived from Miami to view this exhibit, which also included a panel by her and one written by her dad. We spoke of how losing a parent always seems like such a natural part of life, until it happens to you. 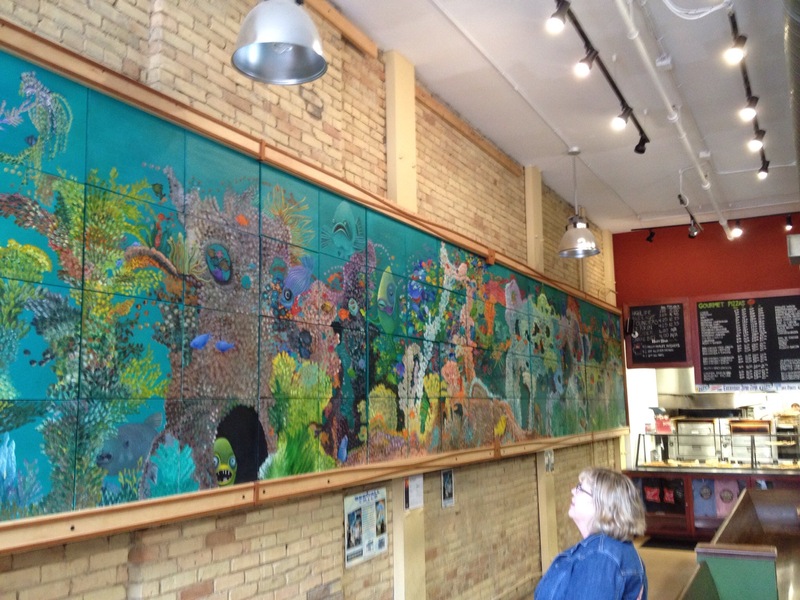 The great thing about ArtPrize is that it engages the community. For 2-1/2 weeks each fall, the town is as alive as Times Square. Deborah Norville from Inside Edition happened to be in town for a separate speaking engagement and had no idea what she walked into. She was blown away. 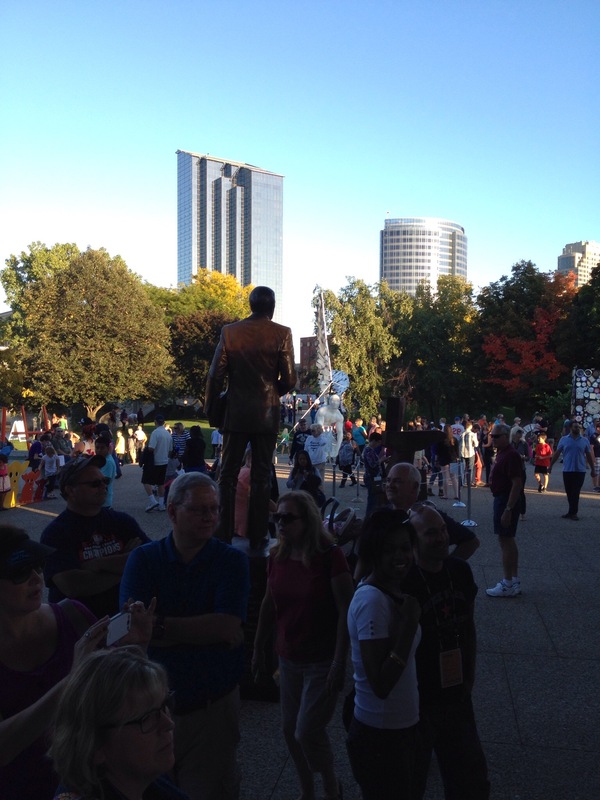 If you ever are in the Midwest in late September and early October, get to Grand Rapids to experience ArtPrize. You will be so very glad you did. Have you ever thought having your own TV show? You could base it on – “On The Road With Charles Kuralt” Your commentator presentation provides a skill that promotes interesting story telling. Loved that show, Mike! Charles Kuralt was one of two people who inspired us to drive the Beartooth Highway in Montana. Maybe we will dabble in YouTube videos somewhere down the road! Have you ever read any of Tom Rademacher’s columns in the Grand Rapids Press? We love his work, and he certainly has had an influence on our desire to choose writing as a medium. The man can weave words into a compelling story like no other, in our opinion. Check out his work, if you get a chance.